Panagiotis Mantis/Pavlos Kagialis (GRE) take out two race wins on race day 3 The breeze of 15-17 knots, gusting up to 20 knots, and choppy sea saw the fleet fly around the track, in a perfect test of racing skills across the three back to back races. In the 470 Women, Israel’s Gil Cohen/Noa Lasry held onto their overnight lead, despite it briefly slipping out of their hands after race 4. Equipment damage with a rip to their spinnaker meant an on-water switch to their older spinnaker, but the pressure did not seem to impact the pair, as they went on to score 5,1 and hold a lead of 5 points. Second to Elena Berta/Bianca Caruso (ITA), with defending European Champions Afrodite Zegers/Anneloes van Veen (NED) bouncing up to third. In the 470 Men, a superior performance from Panagiotis Mantis/Pavlos Kagialis (GRE) saw them win races 4 and 5 and place 2nd in race 6 to seize the lead. The Greek pair are on a 19 point tiebreak over Russia’s Pavel Sozykin/Denis Gribanov (RUS), who scored two third places and then the win. Third to Anton Dahlberg/Fredrik Bergstrom (SWE). Six races done, 5 more to go to decide the top 10 medal race teams. Another stamina day ahead on Tuesday, with three more races scheduled starting at 1300 hours. Despite holding onto their overnight lead, Israel’s Gil Cohen/Noa Lasry didn’t have the best of starts to race day 3. Flash points happen, and today was a day to rise above it which the pair successfully achieved. “We started with a problem to our spinnaker before racing, and then the UFD. So we knew we had to do a good race after and we tried to do our best,” explained Cohen in reference to equipment damage to their spinnaker. “It was very nice out there, big waves and the wind increased with a stable breeze. Italy’s Elena Berta/Bianca Caruso also raced a solid day, and apart from their discard could 5 results inside the top nine. Defending 470 European Champions Afrodite Zegers/Anneloes van Veen placed 3,2,6 and move up to third overall. Just two points behind are Greece’s Maria Bozi/Rafailina Klonaridou, the reigning 470 Junior European Champions, who won the day’s second race and with it climbed ten places up the leader board to 4th overall. “Yesterday really started great with the first race,” said Macarol. “Then in the next two races I don’t know, we didn’t find the right rhythm and we did two bad races. Today was really nice conditions, with 16 knots and big waves, but I think it wasn’t one of our best days. We can do so much better. We did three bad starts and then we were always around other boats and we couldn’t sail fast, but I think we managed to do some good downwind. In race 5, we managed to gain a lot over the two down winds. Keep on improving, keep on trying is the mantra for Hong Kong’s Kit Fong Tong/Anna Lee Fisher. Competing at their first ever 470 Championship, the team is focused on their preparations for the upcoming Asian Games, the continent’s premier multi-sport event which is almost as important as the Olympic Games. 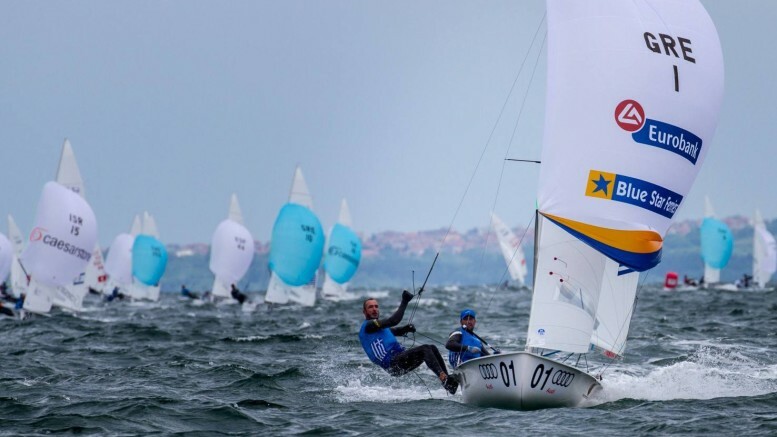 Unfortunately the Games are at a similar time to the Sailing World Championships in Aarhus, so the pair has been forced to choose between the two events. Leading up to the Europeans, the Hong Kong duo has spent four weeks in Bourgas training under the expert hands of Ruslana Taran (UKR), two-time 470 Olympic bronze medallist in 1996 and 2000, and silver medallist in the women’s keelboat in 2004. Fong Tong commented on their experience so far. “There are so many high level 470 sailors here and we are learning a lot from that. We have come here to train for our Asian Games preparation. All change in the leader board top three, as conditions today allowed the more experienced teams to come to the fore. The three back to back races saw an escalation on performance from the Rio 2016 Olympic bronze medallists, Panagiotis Mantis/Pavlos Kagialis (GRE) who took out two wins and a 2nd place to take over the lead up from 11th place at the start of the day. “We reached the middle of the Championship. We are starting at the first place at the moment, but we have still a lot of races,” said Mantis. “Six races in two days is hard,” reflected Mantis. “I am exhausted, and I think Pavlos the same. Sailing at the highest level at the European Championship everyone is pushing hard and we have to do the same. You can’t relax at any point of the race, upwind or downwind. “Tonight we will eat healthy food and sleep eight hours for sure,” he added on their evening ahead. Neck and neck on 19 points are Russia’s Pavel Sozykin/Denis Gribanov. Along with the Greeks they are amongst the most experienced teams in the fleet, most recently finishing 9th at Trofeo Princesa Sofia, and are targeting an upgrade on their best ever 470 Europeans result of 5th back in 2015. “It was a good day and good weather. My team did a good result of 3,3,1 and I like it. These are our conditions – it is very good,” commented Gribanov. Sweden’s Anton Dahlberg/Fredrik Bergstrom put their double-digit scores from yesterday behind, racking up a consistent scorecard of 7,2,3 to move to third overall.